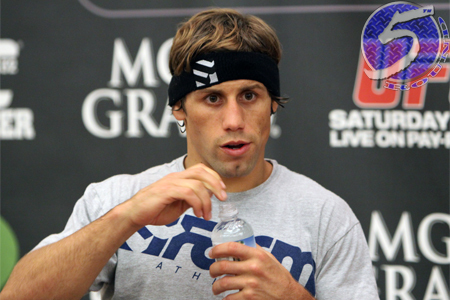 Alex Caceres is in big trouble, because Urijah Faber (pictured) doesn’t lose … in non-title tilts. On Wednesday, ESPN.com reported Faber and Caceres will collide at UFC 175. Faber is looking to bounce back from February’s TKO defeat to reigning bantamweight champ Renan Barao. “The California Kid” owns an impressive 30-7 professional record. All of his defeats have come in championship affairs. Caceres will be riding a four-fight winning streak into the shootout. “Bruce Leeroy” would be looking to collect his sixth straight win had he not flunked his post-fight drug test for marijuana after beating Kyung Ho Kang. That March 2013 contest was subsequently overturned to a no contest. The bantamweight bout will likely appear on the main card. The July 5 event takes place inside Mandalay Bay Events Center in Las Vegas, Nevada.